We are the “Nobels Group.” We established an original production system, which enables us to be efficient producers. We strive to produce the best quality beef, raw milk, and food products. Regarding the production of livestock, we produce fertilized eggs known as embryo production, breeding of calves, raising calves, fattening the cattle, and producing raw milk.We cover the whole process in livestock business. “Fattening after one birth on Wagyu-cross” means to have only one birth from the female cattle, and after she is fattened for more than 32 months. It actually makes the meat quality the best from our research. The child Japanese Black and Wagyu-cross mother are both produced this way. We call the Wagyu-cross “Tokachi Herb Beef”. Herbs are fed to those cattle regularly. That is another secret why the meat quality of Wagyu-cross gets better. That is our own label. Both of Japanese Black calf and Tokachi Herb Beef are highly successful business established by Nobels Group. 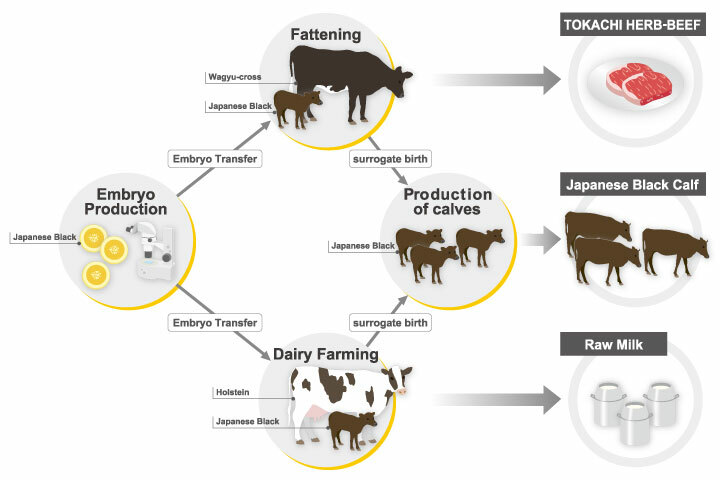 Using the breeding technique of embryo from Japanese Black and Wagyu-cross female, the calf is raised for 9 months. After the 9 months, 4,000 are sold as Japanese Black calves throughout Japan. 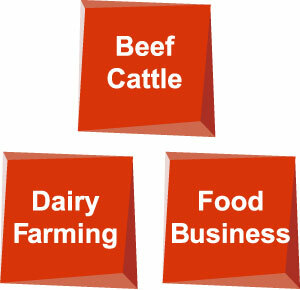 Nobels Group has fundamentals in cattle business and dairy business. Additionally, we developed “TOTAL production” by additional business sector which is “food production”. This integral approach on food production has been ensuring strength in our group as a whole.